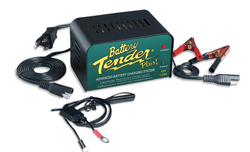 What is a Battery Tender? It’s a device that plugs into a standard AC outlet and transfers power in the form of amps to your 12 V battery to keep it operational over long periods of inactivity. Battery Tender battery chargers are essential if you have seasonal vehicles that sit for months without being used. With a Battery Tender, your vehicle’s battery will still be as fresh as the day you left it. Battery Tender chargers are designed to fully charge a battery and maintain it at proper storage voltage without the damaging effects caused by trickle chargers. •Fully Automatic: At the end of the regular charger cycle, every Battery Tender battery charger automatically switches its output voltage to a safe, storage or float level that eliminates the need to constantly check on the conditions of the battery. •Full Output Power at Low AC Line Conditions: Battery Tender battery chargers will deliver full output power with input AC line voltages as low as 90 VAC. (Excluding chargers with output current of 2 amps or less). •Zero to Minimal Current Draw from Batteries: When the AAC power is disconnected, most Battery Tender battery chargers draw zero current from the battery. A few of the higher power models draw less than 1 milliamp from the battery. •Compact, Lightweight Construction: At any given power level, Battery Tender battery chargers offer some of the highest charging power density in the industry. •Visual Indication of Charge State: Every Battery Tender battery charger has some combination of colored lights to indicate the progress of charging. We offer Battery Tender battery chargers with outputs ranging from .800 amps to a full 5 amps. Various charging algorithms are available to accommodate the wide range of lead acid battery styles: Flooded, Sealed, VRLA, GEL & AGM. Check with the factory for the combination of power, current, voltage and battery style that best meets your needs. Battery Tender battery chargers are equipped with a variety of safety and interconnect options, not available on all models. Safety options include: spark free operation, reverse polarity protection and continuous short circuit protection. Interconnection options include: alligator clips, fused ring terminals and quick disconnect DC output cable harness. A variety of AC input power options is available. Charge and maintain your 12 V batteries with the only line of battery chargers equipped with all these features. With Battery Tender, you can’t go wrong. I purchased a Car Battery Tender. It came on time and with follow up emails. Very quick service! Most popular Battery Tender for full size vehicles. Use this charger on cars, trucks, SUVs, vans, and any other vehicle with a 12 volt battery. Best for motorcycles and small engines. Use this charger on motorcycles, compact cars, ATVs, golf carts, snowmobiles, jet-skis, lawn mowers and other vehicles with small engines. Adjust this charger’s output to suit large and small vehicles. Best for watercraft and recreational vehicles. Use this charger on boats, jet-skis, ATVs, snowmobiles, and vehicles that are stored outdoors.